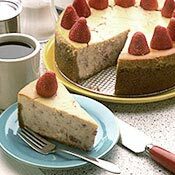 RECIPE TITLE "Strawberry Cheesecake Recipe"
Jewish and Italian immigrants alike brought their own distinctive versions of cheesecake to America. The kind most likely to be found in diners is more typically Jewish, and is now widely known as New York style. If you like, make this particular recipe with a combination of jams and fruit; apricots or plums are especially good. Parrish 9x3 Round Cheesecake Pan with Removable Bottom This 9-in. Round Pan is the one you'll want to use for baking cheesecakes or any cake you wish to decorate and frost along the sides. A removable bottom plate lets you lift the cake out without disturbing the sides, allowing you place the cake on a more decorative stand for decorating and serving. The pan is made of heavy-duty aluminum and measures 3-in. high. FOR CRUST: Preheat an oven to 350 degrees F. Grease a springform pan 9 1/2 inches in diameter and 3 inches deep with butter. In a bowl, combine the crumbs, sugar and melted butter, breaking up any large crumbs and mixing well. Firmly press the mixture evenly over the bottom and about 2 inches up the sides of the prepared pan. FOR FILLING: In a large bowl, break the cream cheese into pieces. Using an electric mixer set on medium speed, beat until soft and creamy, about 3 minutes. Add the sugar and beat until the mixture is smooth, 1-2 minutes. Add the eggs, one at a time, beating well after each addition. Reduce the speed to low and beat in the sour cream, flour, vanilla and lemon zest and juice until thoroughly blended. Remove 1 cup of the batter and place it in a small mixing bowl. Add the strawberry jam, mixing thoroughly, and then gently mix in the chopped strawberries. Pour this mixture into the rest of the batter and stir just until incorporated. Pour into the prepared pan and jiggle the pan until the batter is level. Bake for 1 hour. Turn off the heat and allow the cheesecake to rest undisturbed in the oven until set, about 30 minutes longer. Transfer to a rack and let cool. Cover and chill overnight before serving. Just before serving, run a knife around the pan sides to loosen the cake. Release the pan sides and place the cake on a plate. Arrange the whole berries evenly around the top, marking a slice with each berry. 125 Best Cheesecake Recipes An experienced and innovative pastry chef, George brings his cooking school techniques to one of his greatest loves: cheesecake. Until now you probably didn't realize that so many delectable cheesecake recipes were available. The 125 recipes are broken down into 8 chapters, each more luscious than the last. Explore the delights from his vanilla based chapter with Toffee Cheesecake with Caramel Sauce or Creamy Almond Cheesecake. In the fresh fruit chapter, classics like Fresh Cherry Cheesecake are featured along with such innovative creations as Crisp Apple Cheesecake. A wonderful variety of no-bake cheesecakes are featured along with a nut-based chapter. There is also an inventive selection of savory cheesecakes and a wide variety of chocolate based recipes. Kaiser 10-in. Nonstick Classic Springform Pan with Glass Bottom Kaiser Bakeware offers the broadest product range in the bakeware industry offering both classic and creative shapes. Known for bakeware innovations, Kaiser invented the springform pan, the "intelligent round cake pan" and is the world's largest manufacturer. Kaiser bakeware products have been made to the highest standards of German craftsmanship for over 85 years. Manufactured from steel base metal, the products provide even and gentle heat distribution for even browning and baking. All Kaiser Bakeware pans are safe up to 450 degrees F in the oven. The Classic bakeware line features nonstick coating allowing for quick and release of baked goods and easy cleanup. Made of High-quality steel providing even and gentle heat distribution for consistent browning and baking. The black exterior absorbs heat and provides better browning and shorter cooking times. Lifetime warranty on springform buckles. This 10 inche springform has a glass bottom.